Beautifully written, Andrew. 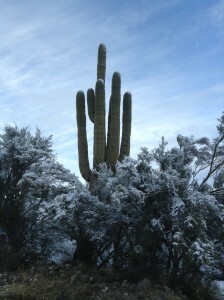 What an interesting parallel between us and the saguaro. Your positive outlook is inspiring. I hope you’ll share more of your writings in the near future. Beautifully written. My brother and I literally had an unexpected snowfall today, as he drove me home from New Year’s Day dinner with our mother. Suddenly road visibility was nearly nil as a snow squall descended. Soon it was gone, leaving a fine layer of soft whiteness like you describe in your desert (here in Canada snow is normal, just the sudden squall was odd). Surviving the elements brings a bonding, a help in our relationship sometimes strained by EI. God’s mysterious ways of working in our lives. Feeling blessed. Thanks Andrew. I’ll be more present to the dustings that come my way this day. Hey Buddy, Nice… Real nice…. written from the heart and the soul and not from the mind… Where the beauty with-in us resides. Very nice reflection, Andy. God is truly everywhere – all we have to do is look more deeply. How lovely! Warm and wonderful, despite or perhaps because of the snow. I have found the desert to have incredible beauty in every season. You described it well my friend. There is a reason to find joy even in those winter moments in our life. Thank you for such an insightful post!